SUMMARY: 18-year old Will Scarlet has a secret that only Robin Hood and his gang know: Will Scarlet is really a girl. Four years ago, "Scar" joined Hood's band of thieves who rob from the rich to give to the poor. As the band's only female member, Scar holds her own among the boys, even as she holds her own secrets close to her heart. No one, not even Rob, knows her past. And Scar is determined to keep it that way...until the day her past catches up with her. WHAT I LIKED: This Thanksgiving, I am thankful for retellings. There are tons in today's YA market, and I almost always love them. From Tiger Lily to Splintered to Rump, YA authors just keep pumping out irresistible retellings that I just can't pass up. And I loved Scarlet, too. Scar and Rob are both infuriatingly stubborn at times, but I loved them for that. Imperfect protagonists are real, and Scar is far from a "Mary Sue." She steals, curses, lies, and throws knives. She's fierce and doesn't back down from anything necessary to save her band and her people. Her self-deprecation and displaced guilt are a little over the top, but they go with her character and provide insight into why she is the way she is. I love the way the townspeople rally around their beloved Robin Hood and try so hard to protect him and his band. The world-building is believable, with many mentions of the brutal Crusades, heavy tax burdens, and corrupt politicians. I also love Gaughen's historical note at the end that explains what is known of the real Robin Hood(s) and the political climate during the Middle Ages. Action! Tons and tons of it will keep readers on their toes. Once I was about 20 pages in, I read the rest of the book in one day. I love that it is not very long (less than 300 pages), so I would have no problem recommending this book to a reader who can read well, but chooses not to. I think Scarlet has the potential to turn that non-reader into a reader. WHAT I DIDN'T LIKE: I do wish Rob were a little better-developed, and Scar's secret past is really easy to figure out early in the story. I personally don't mind the violence or gore, but I can see some thinking the climactic scene is a bit of a bloodbath. THE BOTTOM LINE: An excellent addition to any MS or HS library. 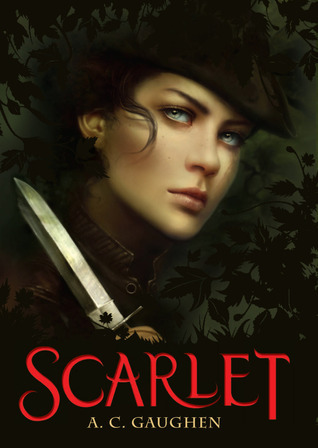 With its gorgeous cover, familiar Robin Hood storyline, and a decent book trailer, Scarlet is very easy to booktalk with students. I definitely plan to read the sequel, Lady Thief, due out in February 2014. STATUS IN MY LIBRARY: We have one copy that is frequently checked out.